If there’s any justice in the world, this artist or that artist will be a huge star. It’s a cliché, but sometimes clichés ring true, and it’s apt when it comes to Andra Day. In concert and in conversation, this woman is the truth. Discovered by Stevie Wonder’s then-wife, Kai Millard Morris, who saw a video clip and passed it along to her husband, Day ended up collaborating with producer Adrian Gurvitz for her debut album, 2015's Cheers to the Fall. Her single “Rise Up” enjoyed a slow burn of popularity and was nominated for a Grammy along with the album. I remember first hearing the song on some television show and running to Google the lyrics to find out who it was. By the fall, I was hearing “Rise Up” everywhere—from the lips of every American Idol hopeful to a Serena Williams Beats commercial. It’s a little hard to talk about Day’s voice because it’s so obviously incredible— clear, powerful and perfectly melodic. Performing Wednesday night at the El Rey theater in Los Angeles on the last stop of her tour, Day appeared on stage in red, embroidered silk Ralph Lauren pajamas and a fur stole. Her hair is up in a now-trademark chiffon scarf and her bangs are carefully pinned down with those metal clips that your stylist uses when blow drying your hair. She frames the show as a conversation—as wanting to share herself with the audience in a way that is vulnerable and genuine. At one point, she talks about how she used to use makeup as a crutch and, wanting to be honest and inmate with the audience, she pulls out a stash of wipes and proceeds to wipe her face clean. During her time in the spotlight, Day hasn’t shied away from the political, performing at a Hillary Clinton rally and appearing in an ESPN special during Black History Month celebrating our history of protest from Rosa Parks to Black Lives Matter. In her set, she talks about Nina Simone, and alludes to a man who couldn’t breathe. For her encore performance she does a cover of Queens “I Want It All.” The performance garnered the biggest applause of the night, which might be surprising until you hear it. It’s a performance that takes you somewhere off of the power of her singing alone and has the kind of spirit that you feel just by talking to her. I spoke to Day in her dressing room after the show. It was a local event of sorts—she is from San Diego—so there were a lot of visitors in the house. When she speaks, there is a clear spiritual undertone to her words, not just from the gospel influences of her music but in the tone of her voice itself. JEZEBEL: It’s the last show of the tour. I know it’s probably been a lot but can you sum it all up? I think it’s been transformational—transformational and a healing experience for myself and for my band. We’ve grown as players and as people and for my audiences as well too. I’ve heard a lot of people say, “Hey, I’m a better person after leaving here,” and I think it’s because it’s a very honest purging of things. Every night has been slightly different. and it’s kind of hard to keep the excitement throughout a tour—every night doing the same thing. It’s been exciting even on this last night just as on the first night. It was interesting to watch the success of “Rise Up” as a single. I remember first hearing it and then watching the audition rounds of American Idol and every other person who was auditioning was singing the song. Then I was hearing it everywhere. It’s really been surprising and not surprising. I think that the necessity of the message and how simple it is for people is really what’s grabbing them. We look at our environment and we see, yes, people need hope. They need to be reminded to persevere. But for it to be a song thats really resonating with people in that way it’s been surprising and I’m grateful. I don’t think I had any real specific goals. Actually, to be honest, when I first made the song I knew it was a meant-to-exist thing, but it wasn’t actually on the album. That came later. And so to watch it grow, it’s been a blessing for me. Sticking with “Rise Up” for a minute, it was featured in an ESPN Black History Month special about the Civil Rights Movement, and you alluded to that a little bit in your set tonight. How do you use the platform you have to discuss the issues you want to bring to light? It was sort of a natural progression of things. And not just a progression but for me as an artist and the artists that I admired when I was young and who I was exposed to at school—artists like Nina Simone and Billie Holiday. These artists that I loved, that’s all I’ve know. They use their platforms to talk about race. I don’t have to worry about coming off stage and someone, most likely, won’t try to physically harm me. When Nina was talking about it, she could walk off stage and expect that somebody might be there to harm her. Being inspired by artists like that, it’s not just a decision. I think it’s a driving force inside me, to do not do music just for myself, but to do it because you have a platform and a you have a responsibility. It’s more than just wanting to do it, I think it’s my responsibility as an artist. Nina Simone is clearly a big influence for you, can you talk about some others? Billie Holiday was a huge one for me—the way she was able to convey emotion in her music even if she didn’t write the song. She just embodied it and owned it. She was, I think, honest about her experiences and her downfall and was honestly kind of a trainwreck, but open so you felt all those emotions with her. Lauryn Hill is another one who was incredible and an inspiration for me. Erykah Badu. Jill Scott as well. Sade. And all the big voices—Aretha Franklin, Gladys Knight, Patti LaBelle, Whitney. There’s a band called Hiatus Kaiyote. They’re bad. When I first heard them I remember being shocked. They’re incredible. Laura Mvula is an artist that I love out of the UK. I listen to gospel. A worship group called The Brilliance their album is called Brother. You’re in the zone when you listen to it. You have a cool aesthetic and I was going to ask you about it but then seeing you tonight when you took off your makeup, I feel like I should be asking you about the opposite. For me, on stage, it used to be a crutch, where it was kind of like my value was in the way I looked. Now, it’s fun and it’s part of the character that I like and part of that rockabilly look that I love so much, which is kind of funny because it’s sort of sacrilege as a pinup to go outside without makeup. I always tell people I’m the laziest pinup you’ve ever met in your life. If I don’t have to put anything on my face I’m not going to do it. But it’s a freeing experience to get to that point in my life. Like I said, when I was all about “Hey, I got to make sure I look good,” my life relationships represented that too. So now I have more meaningful and honest relationships with people and there’s less pressure. I don’t feel like I’ve got to put this on or else I won’t be successful. Now I realize I have a purpose and this doesn’t have anything to do with it really. This is just fun. How was working with Stevie Wonder on Someday At Christmas? It was just incredible. And it’s funny because that commercial didn’t come through Stevie. It came through Apple because they’ve been supporters—Tim Cook is a really incredible human being. He supported the project, he loved the music and so when the idea of the commercial came up with Stevie they said you were the only person we had in mind. They didn’t know until after that he was who discovered me in the fist place, so it just came full circle. Stevie is a reminder for me particularly that no matter how long you’ve been doing this, no matter how much you put out, no matter how big you get, don’t stop having fun and don’t stop remembering that you’re here for a reason. That you’re here to affect people and affect change He’s a such passionate person, you would think he just started this last year. We’re gonna start writing together too. He was playing me some stuff just the other day. We have that to look forward to. Oh definitely and the song is so cool. I can’t talk about it but definitely! 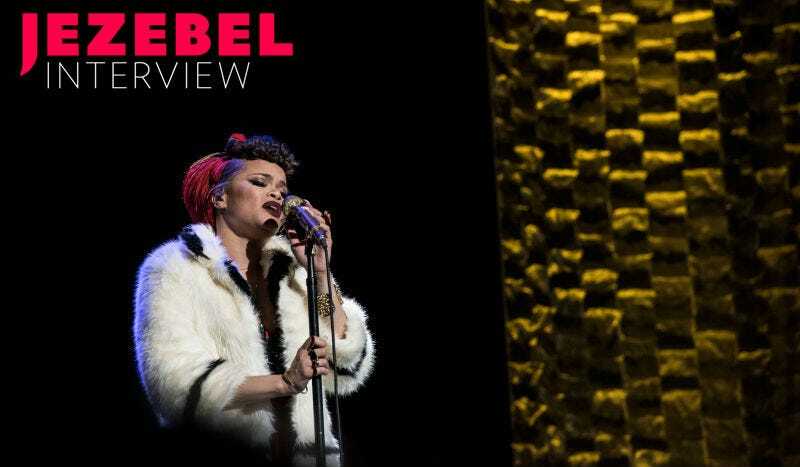 You can catch Andra Day over the next few months touring overseas with Leon Bridges and then back stateside for a slew of festivals, including the Essence Festival and Bonnaroo.